(Francisco Kjolseth | The Salt Lake Tribune) Los Angeles Galaxy forward Ola Kamara (11) battles Real Salt Lake midfielder Sunday Stephen (8) during the first half of the MLS soccer match Saturday, Sept. 1, 2018, in Sandy at Rio Tinto Stadium. Sandy • Less than hour before his memorable introduction, fans crowded the stairwells, phones and cameras in hand, waiting for the last visiting player to emerge from the tunnel inside Rio Tinto Stadium. Once out and into the last bits of remaining daylight, the No. 9 and No. 10 jerseys peppering the seats in Sandy welcomed him the way you welcome a legend. Regardless of what colors he’s sporting, regardless of the forthcoming result. That’s what you do. Because, honestly, how many more times are you going to be able to say that you saw the man himself, Zlatan Ibrahimovic, in suburban Salt Lake City with so much on the line? The record-setting turnout only added to hype. After all the calendar watching, after waiting to see their hometown team battle a worldwide luminary of Ibrahimovic’s class, Real Salt Lake fans got their money’s worth. They wore Zlatan jerseys of old, of Manchester United and Paris Saint-Germain, some hoping to see a majestic moment, career goal No. 500 of all places on the Wasatch Front. Other fans, those clad in red, probably wouldn’t have minded to see Zlatan do his thing — and at this point, we all know exactly what that is — albeit in a losing effort. He was out there, but on this night, he did not find the net, he did not find 500. RSL did all the history-making. Again and again and again and again and again and again. A 6-2 win over the L.A. Galaxy put RSL alone into fourth place into the West. That’s three in a row now and back-to-back outings in which RSL scored six goals — something no team in league history had done until Saturday. Damir Kreilach had the sixth hat trick in club history. Albert Rusnák had two goals and an assist. Jefferson Savarino had a goal and two assists. “Tonight we were extremely clinical and we saw that on the scoreboard,” center back Nick Besler said. “We played unbelievable," Kreilach said. (Francisco Kjolseth | The Salt Lake Tribune) RSL soccer fans get pumped up before a tough match up against L.A. Galaxy Saturday, Sept. 1, 2018, in Sandy at Rio Tinto Stadium. 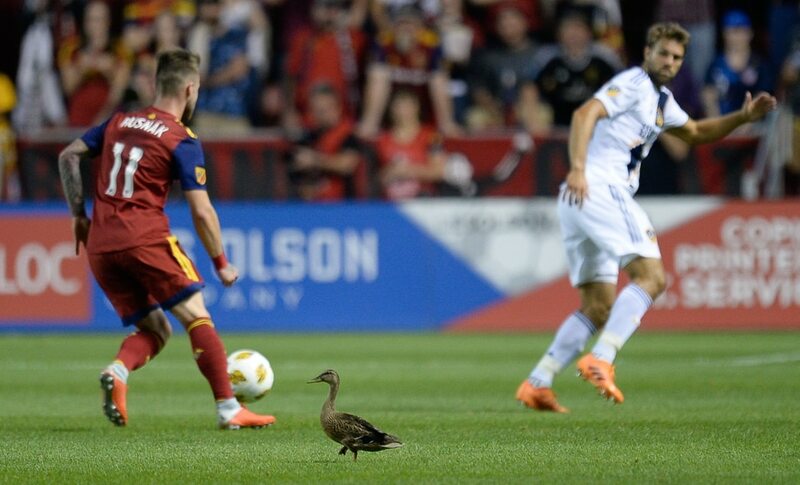 (Francisco Kjolseth | The Salt Lake Tribune) A duck joins the game during the first half of the MLS soccer match Saturday, Sept. 1, 2018, in Sandy at Rio Tinto Stadium. (Francisco Kjolseth | The Salt Lake Tribune) Los Angeles Galaxy forward Zlatan Ibrahimovic (9) battles Real Salt Lake midfielder Nick Besler (13) during the first half of the MLS soccer match Saturday, Sept. 1, 2018, in Sandy at Rio Tinto Stadium. (Francisco Kjolseth | The Salt Lake Tribune) A duck joins the game as a staff member tries to catch him during the first half of the MLS soccer match Saturday, Sept. 1, 2018, in Sandy at Rio Tinto Stadium. (Francisco Kjolseth | The Salt Lake Tribune) Los Angeles Galaxy forward Zlatan Ibrahimovic (9) goes in for a new shirt and medical treatment on his head during the first half of the MLS soccer match Saturday, Sept. 1, 2018, in Sandy at Rio Tinto Stadium. (Francisco Kjolseth | The Salt Lake Tribune) Los Angeles Galaxy forward Ola Kamara (11) battles Real Salt Lake midfielder Sunday Stephen (8) during the first half of the MLS soccer match Saturday, Sept. 1, 2018, in Sandy at Rio Tinto Stadium. (Francisco Kjolseth | The Salt Lake Tribune) Los Angeles Galaxy forward Ola Kamara (11) battles Real Salt Lake midfielder Sunday Stephen (8) during the first half of the MLS soccer match Saturday, Sept. 1, 2018, in Sandy at Rio Tinto Stadium. (Francisco Kjolseth | The Salt Lake Tribune) Los Angeles Galaxy forward Ola Kamara (11) battles Real Salt Lake midfielder Sunday Stephen (8) during the first half of the MLS soccer match Saturday, Sept. 1, 2018, in Sandy at Rio Tinto Stadium. (Francisco Kjolseth | The Salt Lake Tribune) Los Angeles Galaxy forward Ola Kamara (11) battles Real Salt Lake midfielder Sunday Stephen (8) during the first half of the MLS soccer match Saturday, Sept. 1, 2018, in Sandy at Rio Tinto Stadium. (Francisco Kjolseth | The Salt Lake Tribune) Los Angeles Galaxy forward Ola Kamara (11) battles Real Salt Lake midfielder Sunday Stephen (8) during the first half of the MLS soccer match Saturday, Sept. 1, 2018, in Sandy at Rio Tinto Stadium. (Francisco Kjolseth | The Salt Lake Tribune) Los Angeles Galaxy midfielder Jonathan dos Santos (8) battles Real Salt Lake forward Jefferson Savarino (7) during the first half of the MLS soccer match Saturday, Sept. 1, 2018, in Sandy at Rio Tinto Stadium. (Francisco Kjolseth | The Salt Lake Tribune) Real Salt Lake forward Jefferson Savarino (7) attempts a shot on goal past Los Angeles Galaxy defender Perry Kitchen (2) during the first half of the MLS soccer match Saturday, Sept. 1, 2018, in Sandy at Rio Tinto Stadium. (Francisco Kjolseth | The Salt Lake Tribune) Real Salt Lake midfielder Nick Besler (13) battles Los Angeles Galaxy forward Zlatan Ibrahimovic (9) during the first half of the MLS soccer match Saturday, Sept. 1, 2018, in Sandy at Rio Tinto Stadium. (Francisco Kjolseth | The Salt Lake Tribune) Real Salt Lake midfielder Damir Kreilach (6) gets the ball over Los Angeles Galaxy goalkeeper David Bingham (1) before heading it in for his first goal during the first half of the MLS soccer match Saturday, Sept. 1, 2018, in Sandy at Rio Tinto Stadium. (Francisco Kjolseth | The Salt Lake Tribune) Real Salt Lake midfielder Damir Kreilach (6) gets the ball over Los Angeles Galaxy goalkeeper David Bingham (1) before heading it in for his first goal during the first half of the MLS soccer match Saturday, Sept. 1, 2018, in Sandy at Rio Tinto Stadium. (Francisco Kjolseth | The Salt Lake Tribune) Real Salt Lake midfielder Damir Kreilach (6) gets the ball over Los Angeles Galaxy goalkeeper David Bingham (1) before heading it in for his first goal during the first half of the MLS soccer match Saturday, Sept. 1, 2018, in Sandy at Rio Tinto Stadium. (Francisco Kjolseth | The Salt Lake Tribune) Real Salt Lake midfielder Damir Kreilach (6) celebrates his first goal during the first half of the MLS soccer match Saturday, Sept. 1, 2018, in Sandy at Rio Tinto Stadium. 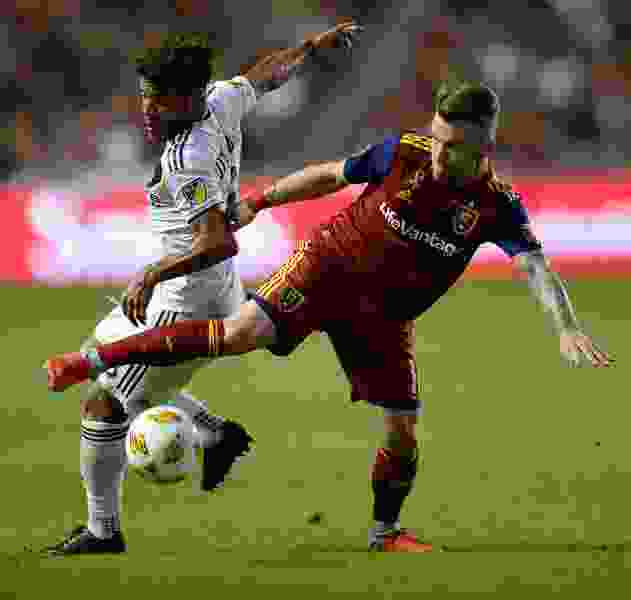 (Francisco Kjolseth | The Salt Lake Tribune) Real Salt Lake midfielder Damir Kreilach (6) has a close shot on goal against L.A. Galaxy during the first half of the MLS soccer match Saturday, Sept. 1, 2018, in Sandy at Rio Tinto Stadium. (Francisco Kjolseth | The Salt Lake Tribune) Real Salt Lake defender Justen Glad (15) and Los Angeles Galaxy midfielder Jonathan dos Santos (8) battle it out during the first half of the MLS soccer match Saturday, Sept. 1, 2018, in Sandy at Rio Tinto Stadium. (Francisco Kjolseth | The Salt Lake Tribune) Los Angeles Galaxy forward Zlatan Ibrahimovic (9) gets heavy pressure from RSL during the first half of the MLS soccer match Saturday, Sept. 1, 2018, in Sandy at Rio Tinto Stadium. (Francisco Kjolseth | The Salt Lake Tribune) Los Angeles Galaxy forward Zlatan Ibrahimovic (9) goes in for a new shirt and medical treatment on his head during the first half of the MLS soccer match Saturday, Sept. 1, 2018, in Sandy at Rio Tinto Stadium. (Francisco Kjolseth | The Salt Lake Tribune) Real Salt Lake forward Joao Plata (10) greets Los Angeles Galaxy forward Zlatan Ibrahimovic (9) before the start of the MLS soccer match Saturday, Sept. 1, 2018, in Sandy at Rio Tinto Stadium. (Francisco Kjolseth | The Salt Lake Tribune) Los Angeles Galaxy forward Ola Kamara (11) shoots past Real Salt Lake forward Brooks Lennon (12) during the first half of the MLS soccer match Saturday, Sept. 1, 2018, in Sandy at Rio Tinto Stadium. (Francisco Kjolseth | The Salt Lake Tribune) Real Salt Lake defender Justen Glad (15) goes up against Los Angeles Galaxy forward Ola Kamara (11) during the first half of the MLS soccer match Saturday, Sept. 1, 2018, in Sandy at Rio Tinto Stadium. (Francisco Kjolseth | The Salt Lake Tribune) Real Salt Lake defender Justen Glad (15) and Los Angeles Galaxy midfielder Jonathan dos Santos (8) battle it out during the first half of the MLS soccer match Saturday, Sept. 1, 2018, in Sandy at Rio Tinto Stadium. (Francisco Kjolseth | The Salt Lake Tribune) Real Salt Lake midfielder Damir Kreilach (6) defends Los Angeles Galaxy forward Zlatan Ibrahimovic (9) during the first half of the MLS soccer match Saturday, Sept. 1, 2018, in Sandy at Rio Tinto Stadium. (Francisco Kjolseth | The Salt Lake Tribune) Los Angeles Galaxy forward Zlatan Ibrahimovic (9) gets a new shirt and medical treatment to his head during the second half of the MLS soccer match Saturday, Sept. 1, 2018, in Sandy at Rio Tinto Stadium against RSL. (Francisco Kjolseth | The Salt Lake Tribune) Real Salt Lake midfielder Damir Kreilach (6) celebrates his hat trick against the L.A. Galaxy during the second half of the MLS soccer match Saturday, Sept. 1, 2018, in Sandy at Rio Tinto Stadium. (Francisco Kjolseth | The Salt Lake Tribune) Real Salt Lake forward Jefferson Savarino (7) celebrates his goal against the L.A. Galaxy during the second half of the MLS soccer match Saturday, Sept. 1, 2018, in Sandy at Rio Tinto Stadium. (Francisco Kjolseth | The Salt Lake Tribune) Real Salt Lake forward Jefferson Savarino (7) celebrates his goal against the L.A. Galaxy during the second half of the MLS soccer match Saturday, Sept. 1, 2018, in Sandy at Rio Tinto Stadium. What transpired Saturday evening will go down in RSL lore, and for so many reasons. The stage, the postseason stakes, Zlatan’s first-ever visit, the ongoing rivalry with the boys from Southern California. All of it. In the end, when this night of goals and jubilation ended, Ibrahimovic had his head wrapped from a cut, and beyond the six goals RSL scored, there was a guest appearance by a duck on the field for a good few minutes that drew cheer after cheer from the 21,363 on hand. Yeah. There was a lot. But the night kicked off in unkind fashion. Just, not in favor of the home side. All it took was 37 seconds. The Galaxy took a 1-0 lead after several RSL breakdowns led to Ibrahimovic passing the ball off to left back Ashley Cole, who looped a cross to the back post where Jonathan dos Santos was there to finish with a right-footed volley into the net. It was the fastest goal ever conceded at Rio Tinto. 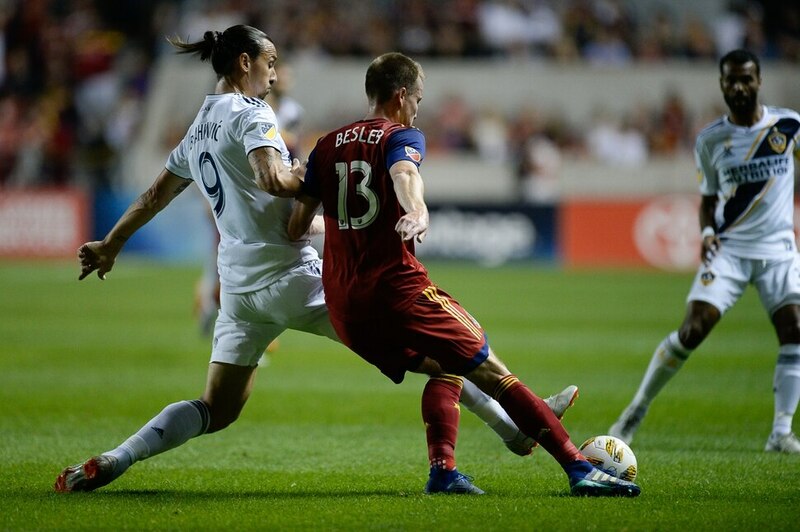 RSL, filled with youngsters and rookie strewn throughout the lineup, didn’t flinch. “They enjoy a bit of pressure,” RSL coach Mike Petke said. Joao Plata and Rusnák made sure RSL wouldn’t be left adrift too long. Plata dribbled the ball into the heart of the Galaxy defense, playing it to Rusnák who took a deft touch around Galaxy defender Michael Ciani and buried it into the far post to knot the match 1-1 in the 14th minute. Ibrahimovic had No. 500 in his grasp the first minute into stoppage time, but after RSL’s offside-trap failed to work, it had to lean on, who else, Nick Rimando. RSL’s goalkeeper kept Ibrahimovic on 499 by getting a piece of the shot from the superstar goal-scorer. By that time, Ibrahimovic’s jersey was covered in blood, coming from a cut behind his right ear. As Ibrahimovic hustled to the sideline to change out his jersey, the Rio Tinto faithful roared when he removed his stained jersey. The adoring whistles took a few seconds to subside. But a minute later, they roared for a much different reason. Kreilach scored what will go down as the goal of the year thus far for RSL in the last minute of first-half stoppage time. The midfielder-turned-striker trapped a long ball from Brooks Lennon, lofted the ball over L.A. goalkeeper David Bingham and had time to head the ball in to complete the undoing of the Galaxy’s backline. Three minutes into the second half, Ciani’s rough night continued as he stuck out a foot on an attempted shot by Savarino that deflected beyond the arms of Bingham to put RSL up 3-1 in the 48th minute. This, again, a minute after another miraculous reaction save by Rimando on a headed attempt by Ibrahimovic kept L.A. trailing. RSL and L.A. traded goals in a two-minute span as Kreilach grabbed his second of the night to put RSL up 4-1, but Galaxy substitute Romain Alessandrini pulled one back for the visitors in the 63rd minute. Rusnák’s second in the 68th — a left-footed mid-air volley — provided more distance. Kreilach’s third, to wrap up his hat trick in the 71st, kept the fans in elated frenzy. These are rare nights. This one won’t be forgotten. “It was brilliant from us,” Kreilach said.